Visiting Mainland Greece you will discover a world of landscapes at your fingertips. Impressive monuments, road trips and journeys that you’ll never forget, and mountains that plunge into the sea – a combination that gives you a never-ending array of choices for your holiday on mainland Greece. How is it possible that such a small country has so much to offer? Continental Greece is a treasure chest of unique experiences whether in the great outdoors or in the realm of culture. Here you will find some of the most popular landscapes in Greece – landscapes with alpine valleys, mountain peaks above the clouds, gorges and canyons, paths through oak, beech and plane tree forests, rivers spanned by arched stone bridges, watermills, waterfalls, national parks with rare flora and fauna. Visit the Peloponnese, Olympia, Delphi, Meteora, Northern Greece, and much more. Visit the exciting city of Athens with its rich Archeological history. Visit the exciting city of Athens with its rich Archeological history and take a tour to Delphi archeological area. 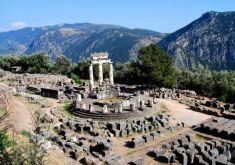 1 week ancient Greece mainland tour. Visit the exciting city of Athens with its rich Archeological history and then visit Olympia and Delphi. 7 night tour of Ancient Greece and Athens. Visit the exciting city of Athens with its rich Archeological history and then follow the 3 night Classical Greece tour to Olympia, Delphi and Meteora. This Greece self drive holiday package combines Athens and tour of the Peloponnese with the freedom of a car. You will have autonomy to travel the beautiful Peloponnese region on your own time with a car rental. We arrange your accommodation for each overnight and will give you a tentative itinerary to follow. 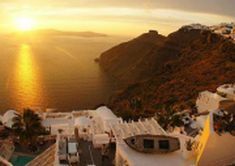 11 day Greece tour package. 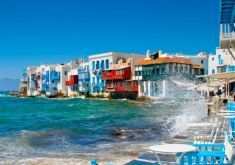 Includes Athens, Classical Greece, history, and time to relax on the beautiful island of Mykonos. If preferred we can substitute Mykonos with Santorini. 11 day Greece itinerary. Includes Athens, Olympia, Delphi, Meteora, and time to relax on the beautiful island of Santorini. Combine Classical Greece with Istanbul-Turkey with this all-in-one vacation package.